Cookie or Creme? As viewers across the country tuned into the Super Bowl, Oreo blazed new trails with its clever “big game” social media activation. The recipe for Oreo’s success? Hard work and strategic planning, with a sprinkle of spontaneity. The brilliant part of this campaign? Oreo sourced cookie artists to whip up edible masterpieces of fan submitted photos, made either of the cookie, or the creme. The creations are mini works of art and run the gamut, from a light bulb, to the Eiffel Tower, people’s faces, pets, and more. Photos are continuing to be posted throughout the week and Oreo’s Instagram account has grown from 2,200 to 56,000+ in just a few days. 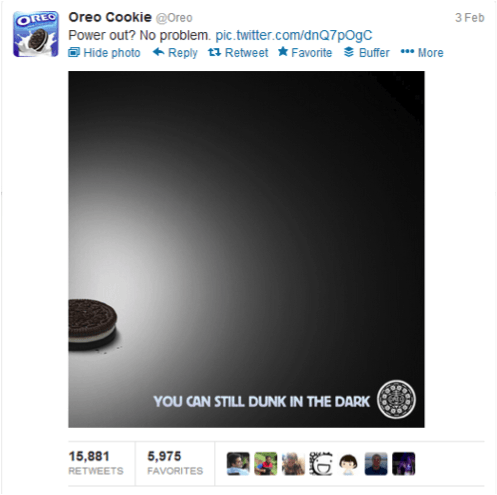 As the campaign was off and running, Oreo struck social media and public relations gold with a serendipitous moment – the blackout. 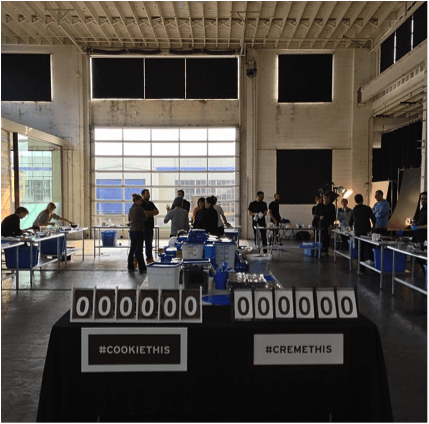 With all of the key stakeholders gathered in a command center for this campaign, Oreo’s team was quickly able to design and get a clever, of the moment ad, up on Twitter. The tweet secured more than 15,800 re-tweets and nearly 6,000 favorites. Oreo’s simple yet effective ad generated significant news coverage and praise for the company’s flexibility. 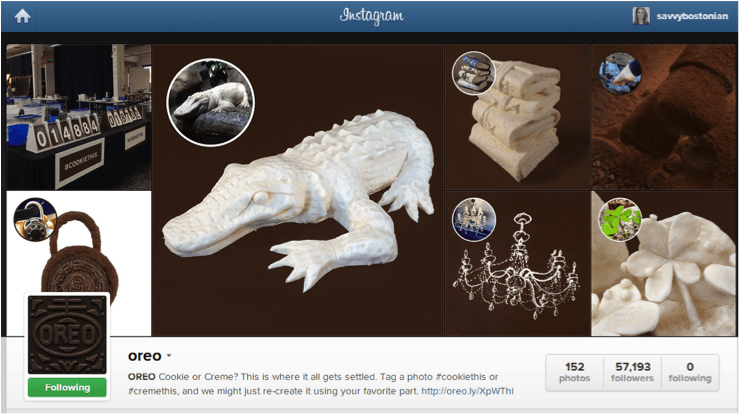 Put Fans in the Spotlight: Though Oreo has a passionate, engaged social media following, its Instagram account only had around 2,200 followers at the campaign launch. By making its fans the star of the campaign by asking them to pick a side and submit photos to be re-created, they directly helped to steer the direction of the campaign and their Instagram account. Embrace Creative Brand Adaptations: While fans played a pivotal role in the success of this campaign, Oreo was smart not to push them too far. The more companies ask for from their fans – e.g. complicated entry requirements, in-depth videos – the higher the barrier to entry. By bringing in expert artists to bring its fan photos to life made participation easy and worthwhile. Personalize Across Platforms: If your fan audience is open to cross-promoting campaigns across different social media platforms, tailor your approach to the platform. For example, Oreo posted unique teaser tweets, plus Instagram and Facebook posts. They also uploaded the photos individually to Twitter, versus sharing from Instagram, for an easier viewing experience. 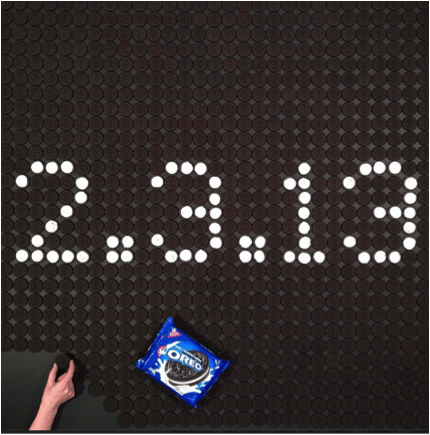 Photos with links to the Oreo Instagram account were also posted to Facebook. 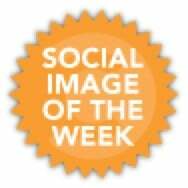 Recognize & Act Upon Serendipitous Moments: It’s no secret that a social media campaign of this magnitude requires an incredible amount of planning and Legal reviews. However, when an unexpected moment or trend spikes, wouldn’t it be great to respond quickly without a ton of red tape? The challenge, should you choose to accept it, is to take initiative now to streamline your review process in order to act swiftly before the world has moved on.